By the time guys reach their forties, they have a new level of focus. From your career to your family, there are so many things that require your attention. That doesn’t mean your wardrobe should be left behind. In fact, it’s all the more reason to ramp things up and stay just as fashionable as you’ve been. Look good feel good, right? In this guide, you’ll find the wardrobe essentials for looking and feeling great well into your 40’s. Let’s start with jeans. We’ve seen too many men in their forties whose jeans have become a major point of contention between them and their significant other. It usually stems from the fact that said-denim is often older than the couple’s oldest child. A new pair of raw denim jeans will breathe life into a stale closet (and make her want to step up her date night attire to boot). Raw denim is dark, unwashed and should be the starting point of any man’s casual wardrobe. The beauty of raw denim compared to washed denim is that over time the denim will fade to your specific wear pattern, giving your jeans unique and authentic fade patterns. The other benefit of raw denim is it dresses up better than faded denim. Dark-rinse jeans work as well for casual Fridays at work as they do for date night. While you want to be comfortable, it’s best to start with a pair that are a little tight rather than a little loose, because they won’t stay that way for long. For many denim brands, it’s not uncommon for the waistband to stretch an entire inch after a few wears (and washes). The seat and thighs should be snug to start but not too snug. The leg opening is a matter of personal preference, but keep in mind it should never be so slim that you cannot get your foot through. As for length, always err towards longer rather than shorter. Your jeans can always be made shorter, but it can’t be lengthened. Just like a bad pair of dress shoes can ruin a great look, a terrible pair of sneakers can take a casual outfit from “still stylish” to “so sloppy.” Everyone is familiar with the official sneaker of dads everywhere – the generic, non-descript walking shoe – but that doesn’t have to be you! There are plenty of sharp sneaks out there for the discerning older gentleman. A sophisticated street shoe can help you elevate your look without sacrificing comfort. A classic white tennis shoe is a great place to start. While most people refer to all sneakers as tennis shoes, we are talking about sneakers specifically inspired by classic shoes worn by tennis players. The most iconic tennis shoe of them all is the Adidas Stan Smith. With its leather upper, clean shape, and iconic green heel, it’s the forefather of so many other styles of sneakers you know (and love!) today. Numerous brands are making their version of this classic style, providing you a range of styles at different price points. 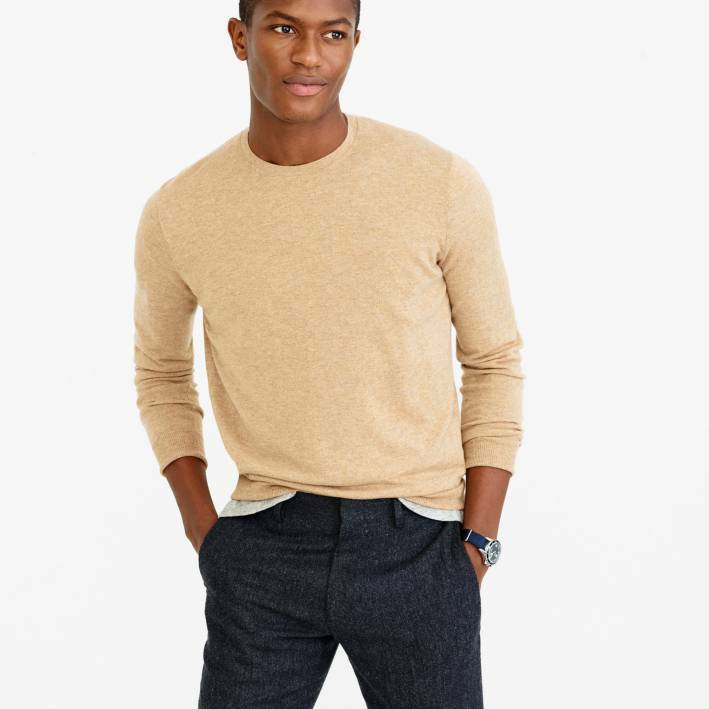 As you get older and family/work obligations take up more of your time, it’s important to still treat yourself, and a good cashmere crewneck sweater is a great place to start. There’s no fabric that’s more synonymous with luxury than cashmere. It’s superior to merino wool because of its softness and lightweight. Nothing compares to the soft, lofty feel of cashmere. You get all of the warmth without the scratchiness. A sloppy fit can make a $1000 sweater look like a flea market find. When shopping for a sweater, pay special attention to the sleeves and waist. Avoid sweaters with baggy sleeves as they give an unflattering bat-wing effect (nobody wants that). Look for high armholes and slim sleeves. Cashmere has a natural stretch which will accommodate any well fitting shirt worn underneath. Like the sleeves, the body of a well-fitting cardigan should be close to the torso without being tight. To avoid the dreaded muffin-top, look for sweaters with a good amount of give in the waistband. If the waist is too tight, it will creep up and visually add a few more lb’s. It’ll be hard for the Mrs. to keep her hands off of you in a good cashmere sweater. In your 40’s, you’re hopefully feeling more settled in your career; maybe you’ve even reached a point where you don’t have to adhere to any dress code (unless you’re the one setting it). Even so, you still need to walk in the office looking ready for work. You’ve probably amassed a sizable collection of nylon messenger bags from conferences. They are like the free college t-shirt of the professional world. Every aspect of your look should command the level of respect you’ve worked so hard to earn by your forties. A leather briefcase gives an air of sophistication and is more functional than most guys give the office accessory credit for. Leather is highly durable and will only get better with time and are now being made with pockets for everything: from your folio to your tablet. A good leather briefcase is the sort of piece that can eventually even become an heirloom, passed down when your son is ready to start building his essentials wardrobe. Speaking of heirlooms, an heirloom watch is a big but necessary step/piece for any guy in his 40’s to take with his style. Sure, a good watch will set you back a few bucks, but consider it a celebration of your successes up to that point in life. In the words of Aziz Ansari, “treat yo’self.” Whether vintage or new, look for a watch that carries significance to you. Once you pick the watch, simply wear it. While you may have spent a pretty penny, it’s meant to be worn and not looked at. You might as well get your money’s worth. You’ll know when the time is right (no pun intended…unless you chuckled) to pass it down. If you’re ready to upgrade your style but dread the thought of shopping for new clothes…consider having Team SG shop for you! We’re obviously biased, but clients tell us how helpful our online shopping recommendations are for saving time and energy!